The Humanity Of Benjamin J. Grimm | The Fantastic Flame On! I guess this one counts, even though it’s not a full return to human form. One of the central conceits of this issue is that Diablo’s alchemy is able to partially restore Ben’s human form, reducing his monstrous exterior to little more than a severe skin complaint, whilst retaining a large portion of The Thing’s strength. In the way of all such hokum, the reversion proves to be temporary, and appears to come with some kind of mental persuasion. Ben returns to his Thing form after only 5 pages. Lured to Yancy Street, The Thing is attacked by one of Doctor Doom’s powered henchmen. Not content with giving Ben a run for his money in the punching stakes, the minion also has a cosmic beam gun which triggers a transformation back into his human body. 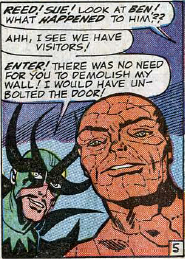 It’s perhaps a sign of the relative regularity of this event – on average, once every three issues Ben returns to human form – that his first thought isn’t ‘Hurrah! My humanity has returned’. Instead, he’s more concerned with who might have been able to invent such a beam gun. I’m a big fan of this transformation from the Thing to Ben. Unlike several in the past, this is not really random, and it serves the plot. Without this happening, the Four would likely still be slaves of Rama-Tut. Now, this is more like it. Doctor Doom is causing worldwide chaos, and the Fantastic Four are powerless to stop him, thanks to the giant floaty marshmallow men things, which recorded the Fantastic Four’s… er… something, and made his ship invulnerable to them. Reed comes up with a loophole – the human form of Benjamin J. Grimm, which should be able to pass the shields and lower them, allowing the rest of the team to board the skyship. Unlike last issue, where Ben’s transformation felt like nothing more than a cheap gag and a space-filler, here it serves a valid plot function, getting the team into a direct confrontation with their nemesis. Don’t forget to let us know your favourite under-rated Fantastic Four stories! It’s been a very long time since we’ve seen Ben pop back to human form. I wonder if he’s forgotten what his regular face looks like? Today’s transformation comes in the middle of a spot of spring cleaning. It’s probably the most typical sort of transformation for Ben. 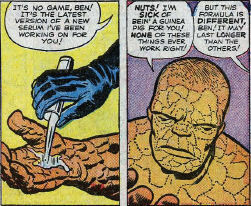 Reed has concocted a potion or serum that he happily feeds Ben without any concerns as to its side-effects, carcinogenic contents, any allergies Ben may have, etc. 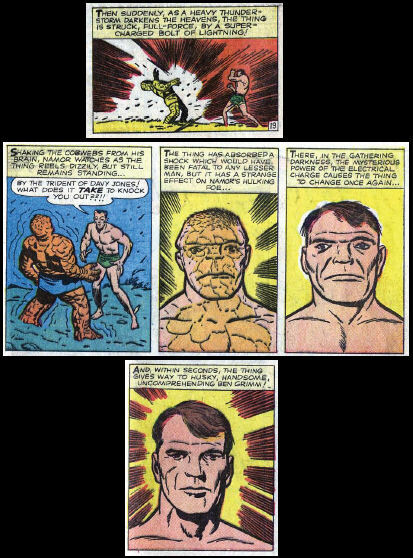 As we all know by now, these transformations rarely stick, although it’s a full three pages before we see Ben as The Thing again. Rather unusually, the transformation back happens off panel, and not a single member of the team comments on it.